Secured a grant to redesign the discovery tank area of the Great Bay Discovery Center, with a newly installed mural, interactive exhibits, and improved tank design. Launched the Great Bay Tide Turner program, to encourage homeowners to reduce their impact on the estuary through decreased stormwater runoff and changes in their lawn care habits. Redesigned the entry way for the Hugh Gregg Coastal Conservation Center, with information on the ecology of the uplands, history of the Center, and role of the Stewards. Secured funding for a new marine debris exhibit at the Great Bay Discovery Center, with interactive games for young visitors. Helped support the development of an audio interpretation of the Great Bay Discovery Center as well as an introductory video, all permanently hosted on a dedicated YouTube channel. Enabled grant-funded work on community climate resiliency, living shorelines, buffer management, marine debris removal, and saltmarsh mapping and monitoring. 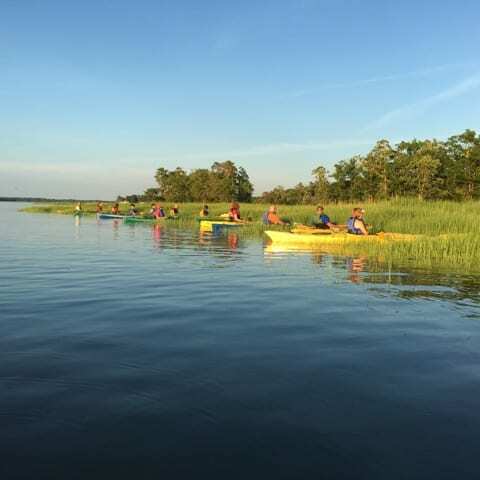 Hosted a summer kayak outing for Stewards members. Organized the 13th annual Art of Great Bay Show, with a theme of “Art Inspired by the Great Bay.” Nearly 60 artists participated in the show, with almost 700 visitors throughout the weekend, including a ‘senior tea’ hosted for several area retirement communities. Sponsored the 18th Great Bay 5K road race, with more than 500 registered runners. Supported the production, printing and mailing of Great Bay Matters. Continued to support the fall and spring school programs at the Great Bay Discovery Center. Provided assistance to the Reserve’s Teacher on the Estuary (TOTE) program. Held successful community suppers at Flatbread Pizza and Robert’s Maine Grill.